The city of Memphis, located on the Nile near the modern city of Cairo, was founded around 3100 B.C. as the first capital of a recently united Egypt. The choice of Memphis by Egypt's first kings reflects the site's strategic importance. First, and most obvious, the apex of the Nile River delta was a politically opportune location for the state's administrative center, standing between the united lands of Upper and Lower Egypt and offering ready access to both parts of the country. The older predynastic (pre-3100 B.C.) centers of power, This and Hierakonpolis, were too remote from the vast expanse of the delta, which had been incorporated into the unified state. Only a city within easy reach of both the Nile valley to the south and the more spread out, difficult terrain to the north could provide the necessary political control that the rulers of early dynastic Egypt (roughly 3000-2600 B.C.) required. The region of Memphis must have also served as an important node for transport and communications, even before the unification of Egypt. The region probably acted as a conduit for much, if not all, of the river-based trade between northern and southern Egypt. Moreover, commodities (such as wine, precious oils, and metals) imported from the Near East by the royal courts of predynastic Upper Egypt would have been channeled through the Memphis region on their way south. In short, therefore, the site of Memphis offered the rulers of the Early Dynastic Period an ideal location for controlling internal trade within their realm, an essential requirement for a state-directed economy that depended on the movement of goods. Equally important for the national administration was the ability to control communications within Egypt. The Nile provided the easiest and quickest artery of communication and the national capital was, again, ideally located in this respect. Recent geological surveys of the Memphis region have revealed much about its topography in ancient times. It appears that the location of Memphis may have been even more advantageous for controlling trade, transport, and communications than was previously appreciated. Surveys and drill cores have shown that the level of the Nile floodplain has steadily risen over the last five millenniums. When the floodplain was much lower, as it would have been in predynastic and early dynastic times, the outwash fans (fan-shaped deposits of sediments) of various wadis (stream-beds or channels that carry water only during rainy periods) would have been much more prominent features on the east bank. 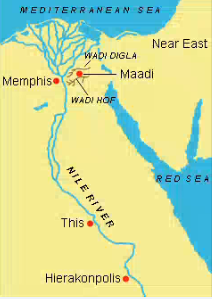 The fan associated with the Wadi Hof extended a significant way into the Nile floodplain, forming a constriction in the vicinity of Memphis. The valley may have narrowed at this point to a mere three kilometers, making it the ideal place for controlling river traffic. Furthermore, the Memphis region seems to have been favorably located for the control not only of river-based trade but also of desert trade routes. The two outwash fans in the area gave access to the extensive wadi systems of the eastern desert. In predynastic times, the Wadi Digla may have served as a trade route between the Memphis region and the Near East, to judge from the unusual concentration of foreign artifacts found in the predynastic settlement of Maadi. Access to, and control of, trade routes between Egypt and the Near East seems to have been a preoccupation of Egypt’s rulers during the period of state formation. The desire to monopolize foreign trade may have been one of the primary factors behind the political unification of Egypt. The foundation of the national capital at the junction of an important trade route with the Nile valley is not likely to have been accidental. Moreover, the Wadis Hof and Digla provided the Memphis region with accessible desert pasturage. As was the case with the cities of Hierakonpolis and Elkab, the combination within the same area of both desert pasturage and alluvial arable land (land suitable for growing crops) was a particularly attractive one for early settlement; this combination no doubt contributed to the prosperity of the Memphis region from early predynastic times.